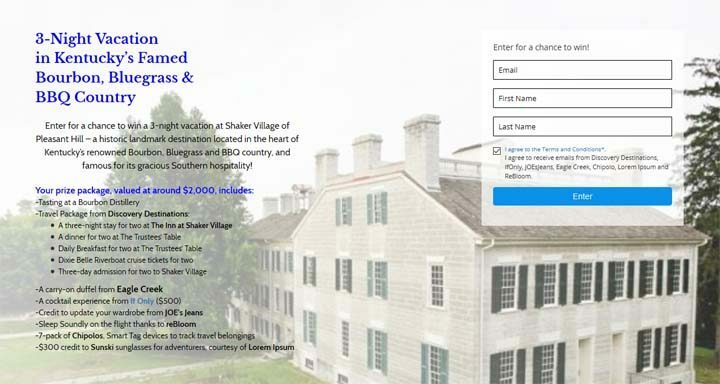 The 3-Night Getaway to Kentucky’s Famed Bourbon Trail Sweepstakes is open to anyone who is at least eighteen (18) years of age within the continental United States and has a valid email address excluding Rhode Island. The 3-Night Getaway to Kentucky’s Famed Bourbon Trail Sweepstakes ends on July 5 at 12:01 am EST. You may enter the Sweepstakes by visiting the sweepstakes site (giveaways.dojomojo.ninja/landing?promo_id=20164693-5180-4e9d-b43d-a84836d78453&campaign_id=1306) and completing the Sweepstakes entry form. There is a limit of one (1) entry per person/email address. Total Average Retail Value (ARV) of the prize package $2,000.